I love the effect the different patterns of washi tape has given to this card and with our free template the origami letters are very easy to make. 1.Download the origami template and make your DAD letters, I used a bit of double sided tape to keep the folds down. Set aside for later. 2.Take a blank 6x6 card and diagonally cover with lengths of washi tape to cover the whole front of the card. Trim the edges so they are flush to the card. 3.Cut a piece of vellum card 13.5 x 13.5 cm and stick down in the corners with glue, cover the glue marks with red gems. 4.Use double sided tape to stick down your origami letters. We think Dad will love this card on Father’s day. 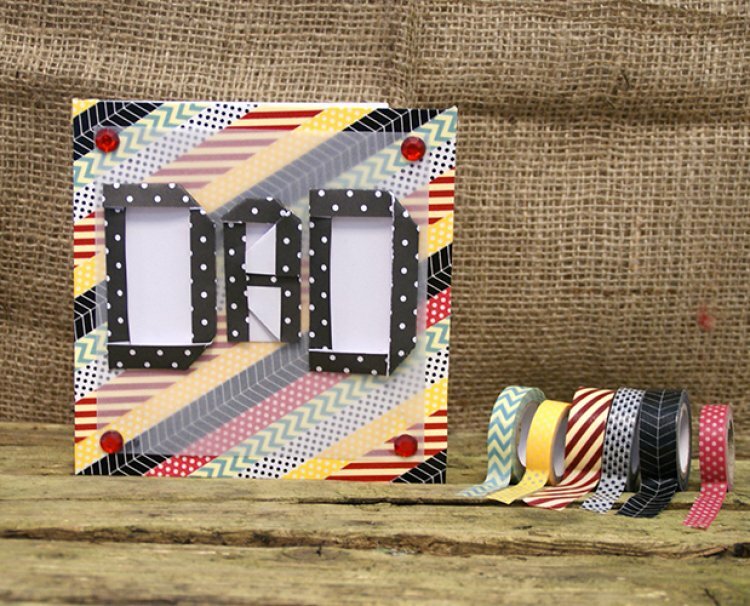 Don’t forget to show us your Father’s Day makes in the project gallery.